In anticipation of leftover turkey this week, I decided today was the perfect day to develop my very own sauce for a Turkey Reuben. We have delicious rye bread here in our bakery at Eckert’s, our Amish sauerkraut is yummy and of course we have great Swiss and turkey in our Dietz and Watson line of deli meats and cheeses. So, all I needed was a unique sauce to set my Reuben apart. I decided to experiment with a few Russian Dressing recipes. For those of you wondering what the difference is between Russian dressing and Thousand Island, I found (after some internet digging) that Russian dressing usually has a little more kick thanks to horseradish and Thousand Island is a little sweeter and usually includes pickles. I like the idea of a little kick so I used Stonewall Kitchen’s Country Ketchup which has some spice. I also added some Sriracha to heat it up another notch. After several tweaks and trials, I arrived at this balance of ingredients. Fresh lemon juice and Worcestershire sauce give the sauce tang and depth. I only added a dash of Sriracha but you spicy food-lovers should add more! This dressing can be stored in the frig for up to two weeks and in addition to a great Reuben sauce, it is also a wonderful dip for veggies and makes a great salad dressing for hearty greens. The rest of the sandwich is pretty straight forward. 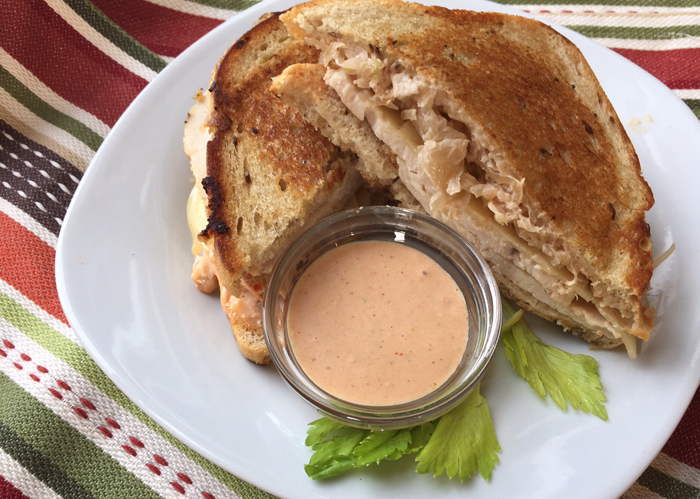 I think the sweet and spicy dressing with the tangy kraut and creamy cheese are perfect accompaniments for turkey on rye. Give this recipe a try this if you have leftover turkey needing a new look. No leftovers? No worries? We have a delicious Oven-Classic Turkey in our deli! Place all ingredients in a blender or small food processor. Pulse until sauce is smooth. Taste and add hot sauce to your preference. Transfer to a canning jar and store in refrigerator for up to 2 weeks. Makes about 1 ¼ cup. *Country Ketchup has a little kick to it. If substituting regular ketchup, more hot sauce will be needed. Butter one side of each slice of bread. Place one slice, butter side down on skillet over medium-low heat. Top with Baby Swiss, Turkey, kraut and a dollop of dressing. Place second piece of bread on top with butter facing up. Grill until nicely browned and cheese is melted. Flip and repeat. Serve immediately with a side of dressing. Serves 1.